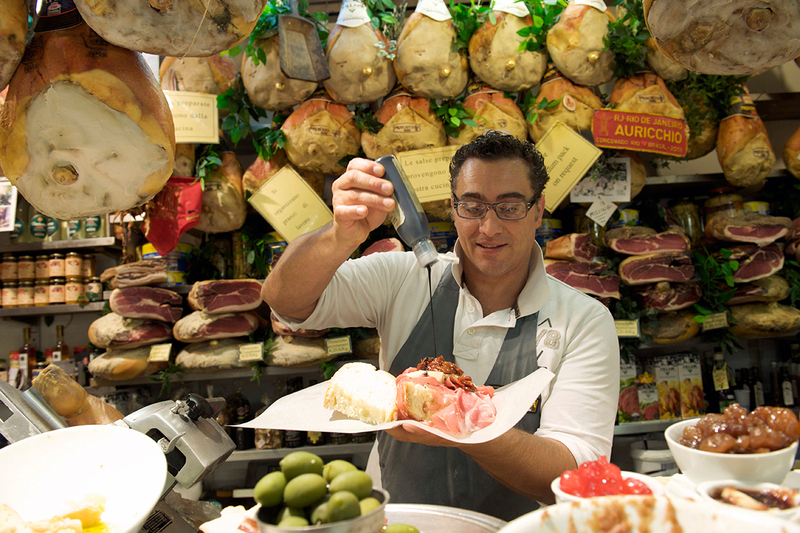 Food is part of the Tuscan identity and the markets here are famous for selling great-quality local produce. 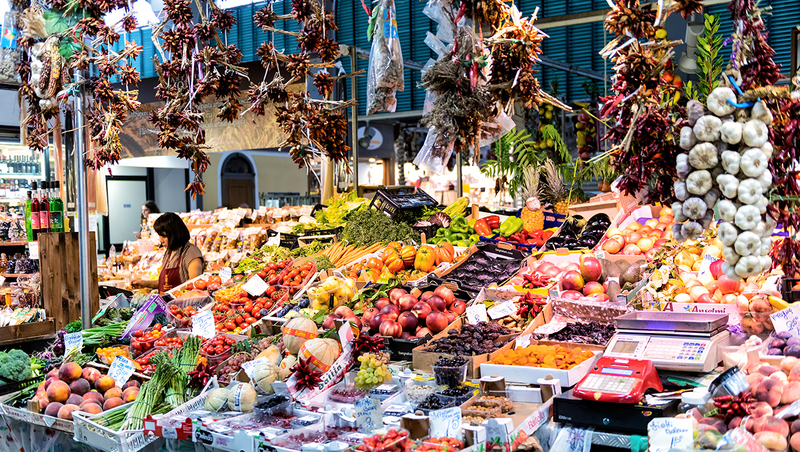 So how can you make the most of your Tuscan market experience to get an authentic taste of the region? Firstly, keep it simple. You’ll find Tuscan flavours to savour even if you just buy a loaf of freshly made bread and some local olive oil to dip it in, a packet of ricciarelli or cavallucci biscuits to share, or a sandwich made with pecorino or caciotta cheese and local salumi (if you’ve never tasted a finocchiona sandwich, you really should). That Tuscan bread forms the basis of many favourite regional dishes, too, which are easy to make at your villa – such as ribollita (vegetable soup), pappa al pomodoro (bread and tomatoes), and summer favourite panzanella (tomato and bread salad). Pici, a thick rustic spaghetti from the Siena area, is delicious dressed with a tomato or ragù sauce. And keep it seasonal. Italians always cook with the vegetables and fruits that are in season, just as they return to the same cheese stall week after week. Don’t be afraid to ask to try the food you’re thinking of buying – you will learn by tasting as you shop. ‘Posso assaggiare, per favore’ is all you need to say. There are markets across the region to visit, but here are some of my favourites. 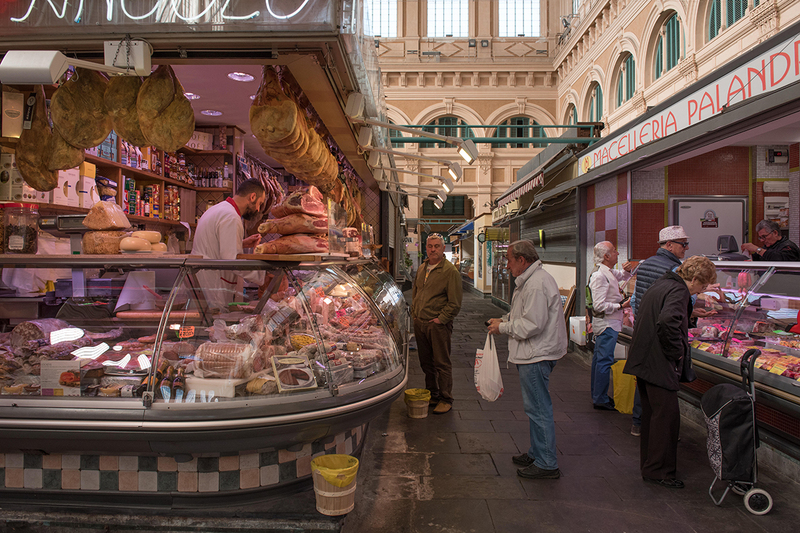 Try specialities such as a Lampredotto panino (tripe sandwich) at the food hall in Florence’s 19th-century iron-and-glass-covered market. You’ll find carne Chianina here, too, the prestigious meat from Chianina cattle, one of the oldest breeds in the world, from nearby Valchiana. Ask for a Fiorentina, a thick cut of beef that has the bone attached, then cook it rare back at the villa. Time and place: 8am-12pm daily, Piazza del Mercato Centrale. Sometimes simply called Mercato Centrale, the fishermen deliver their catch in the morning, and by lunchtime the signore livornese are rustling up delicacies such as cacciucco alla livornese (a thick soup with fish and seafood), triglie alla livornese (red mullet cooked in tomatoes and garlic), and baccalà alla livornese (cod with potatoes and onion in a tomato). The market has two rooms, one for fish and the other for fruit, veg, bread, wine and other local products, so you’ll find everything you need. Red mullet or cod are good choices for building up your confidence in cooking like the Tuscans – and some local white wine to accompany the dish you create. Time and place: 7.30am-2pm Monday to Saturday, Via Buontalenti. What better setting for some gastronomic shopping than beneath the towers of San Gimignano? The town’s Thursday market offers local products such as saffron and salumi made from the Cinta Senese, a breed of pigs that’s bred on the Sienese hills, that include prosciutto, salami and capocollo. Then there’s pecorino from Val d’Orcia. Pick up a porchetta sandwich as you browse (roasted suckling pig with garlic and herbs) – when it’s good, it’s divine. Time and place: 8.30am-1.30pm Thursday, Piazza Duomo, Piazza delle Erbe, Piazza della Cisterna. Tuscany has its fair share of farmers’ markets offering the opportunity to buy direct from the producers seasonal, genuinely local (and also organic) products, often with DOP or IGP certificates of quality. This one in the province of Arezzo is good for Tuscan wines, oil, cheeses such as pecorino and caprino, salumi such as briciolona and finocchiona. Freshly made dishes include polpette (meatballs) and sauces for pasta. Time and place: 9am-2.30pm, 4.30-8pm Monday to Saturday and first Sunday of every month, Piazzetta Logge del Grano, 5. Prato is easy on the eye and has a wonderful weekly farmers’ market, too, where you can buy salumi, cheeses, meat, fish, honey, jam, wine, oil, fresh pasta and bread. The stallholders take a summer break in the second half of August, so it’s best to check the Facebook page for details @mercatoterradiprato. Time and place: 8am-1pm Saturday, Piazza di Mercato Nuovo. The market in pretty Cortona takes place in one of its most picturesque spots, the Piazza Signorelli and surrounding streets. Pick up local cheeses and salumi and a loaf of Tuscan bread to whip up a few bruschetta topped with some plump summer tomatoes. If you want inspiration about how to cook like a local, stop for lunch at Osteria del Teatro. Time and place: Saturday morning, Piazza Signorelli. Osteria del Teatro, via Giuseppe Maffei 2. Rachael Martin is a travel journalist, author and photographer who lives in Italy. Follow her on Instagram @rachinitaly.